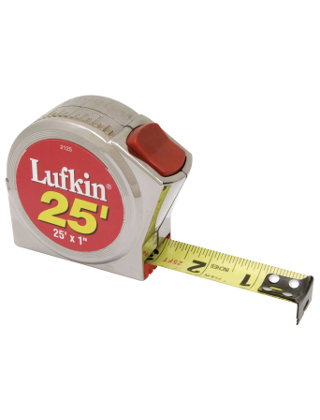 The Lufkin 2000 Series 25' Power Tape Measure is a silver metal clad tape which features a rounded case with convenient top thumb lock. The end hook is unbreakable and the 2000 series features a rubber bumper that prolongs tape life. Graduated in feet and inches to 1/16. Tape blade is 1" wide.